Sew vs. Sow – What’s the Difference? Home » Sew vs. Sow – What’s the Difference? If you have a hole in your pants and you need someone to fix it, should you ask the person to sew your pants or sow your pants? You’d better be sure. In one scenario, you will end up with a nice pair of repaired pants. In the other, not only will your pants still have a hole in them, but they will probably also be buried in the dirt. Sew and sow are homophones, which means they are pronounced identically but have different spellings and meanings. If you like to wear your pants without having to dig them up first, keep reading for an explanation of these confusing words. 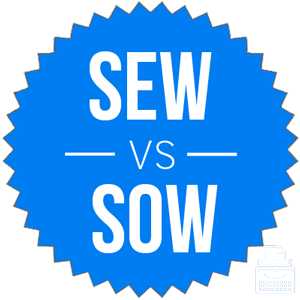 What is the Difference Between Sew and Sow? In this post, I will compare sew vs. sow and use each word in several example sentences. This way, you can see how it appears in context. Plus, I will show you a helpful memory tool that makes it easier to choose sew or sow next time you need one of these words for your own writing. What does sew mean? Sew is a verb. It means to stitch material together into garments or other items. A person might sew a dress for a friend, for instance, or if the seam of a jacket tears, someone could potentially sew it back together. When you learn to sew your own clothes, you can save thousands of dollars or become a fashionable clothing designer. There are many ways to conjugate sew. Here are a few of the ones you are most likely to find. What does sow mean? Sow is also a verb. To sow is to scatter seeds on the ground so that they will grow into a crop, which you can later harvest. I will sow enough corn to last us through the winter. “You should be out sowing the fields, not hiding in the barn with your banjo!” yelled Farmer Ben. Sow and sew rhyme, and they also rhyme with so. Sow also has a homograph that rhymes with cow, and refers to an adult female pig. Homographs are words that are spelled the same, but are pronounced differently and have different meanings. Sew refers to the act of stitching fabric into garments, or repairing garments by stitching them back together. Sow refers to planting seeds. Sow vs. Sew Check: Since sow and crops are both spelled with an O, and you sow seeds to turn them into crops, it is easy to remember to use sow when you are talking about crops. Is it sow or sew? Sew and sow are homophones. To sew is to stitch fabric together. To sow is to scatter seeds. Although they are pronounced identically, they mean different things and are never interchangeable. 1 What is the Difference Between Sew and Sow? Serigraph vs. Lithograph – What’s the Difference?